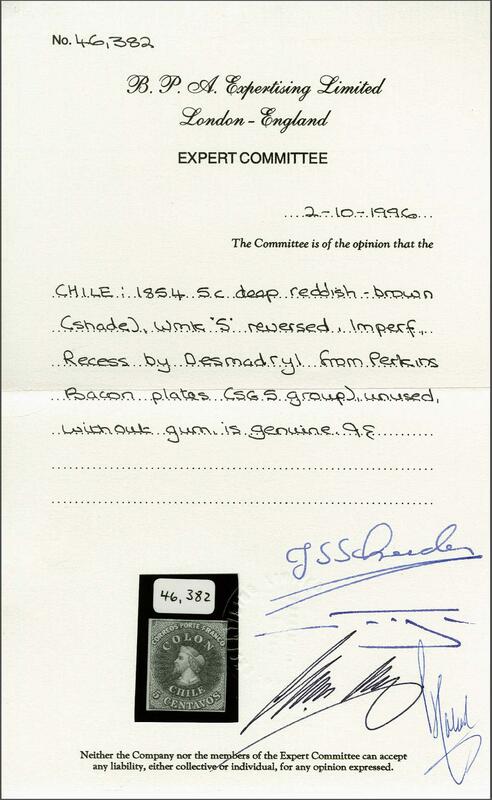 Recess by Narciso Desmadryl from Perkins Bacon Plates 1854 (Jan-Feb): 5 c. deep (rose) reddish brown, wmk. pos. 2, with vertical marginal lines in watermark from left of sheet, fresh and very fine unused example with margins all round, of resplendent colour in the 'rose' shade, without gum. A scarce and attractive stamp. Cert. BPA (1996) Gi. 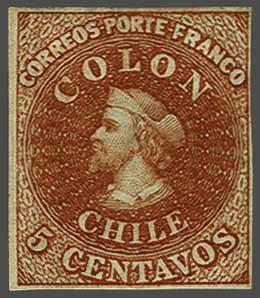 5 = £ 400+/Scott = $ 650.rnProvenance: Collection Joaquin Galvez, Corinphila sale 62, May 1979, lot 3100; Collection 'Islander', Corinphila sale 95, Dec 1996, lot 806.